In elk country, the wind is always a concern. 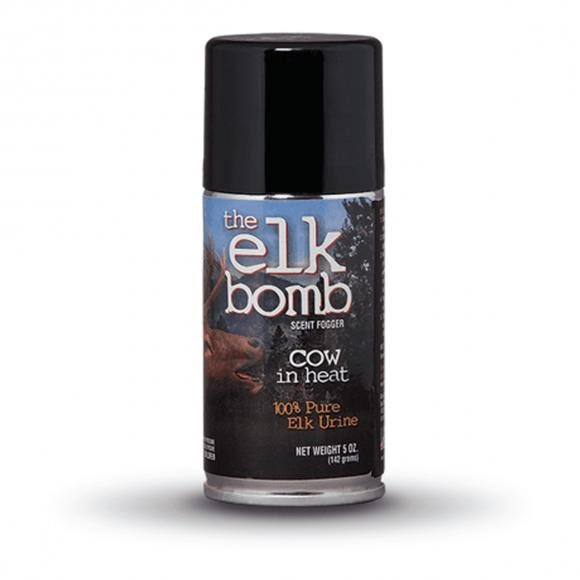 With the Elk Bomb Cow in Heat, you're equipped with 5 ounces of pure, fresh cow elk urine that's both a potent attractant and a powerful cover scent. When closing the distance on a bull, a five-second burst will allow you to check the wind and gain precious extra yards when stalking in swirling winds and shifting thermals. In elk country, the wind is always a concern. With the Elk Bomb Cow in Heat, you&apos;re equipped with 5 ounces of pure, fresh cow elk urine that&apos;s both a potent attractant and a powerful cover scent. When closing the distance on a bull, a five-second burst will allow you to check the wind and gain precious extra yards when stalking in swirling winds and shifting thermals. The simple convenience of Elk Bomb Cow in Heat from Buck Bomb means the end of fumbling with messy screw-top bottles of attractant scent. If hunting from a stand or blind, the NVERTR 180-degree ball valve lets you spray the scent in short bursts - even upside down - to quickly diffuse a change in wind direction. Or, lock down the valve and empty the contents of the can all at once to unleash a potent cloud of scent that can travel in excess of a quarter mile on a 3 mph breeze. The atomized scent sticks to everything it contacts, creating a natural scent trail right to your location. Each can of Buck Bomb features the NVERTR 180° ball valve that allows it to be sprayed in short bursts even when the can is held upside down. Or, you can lock down the valve and empty the contents all at once. Buck Bomb scent particles can travel in excess of a quarter mile on a 3 mph breeze. The atomized scent sticks to everything it contacts, creating a natural scent trail right to your location.